Have you ever considered writing a letter to your younger self? ‘Imagine’…if you had the wisdom you have now back then. Here is mine. It’s kinda personal, but hey – we are all in this together. 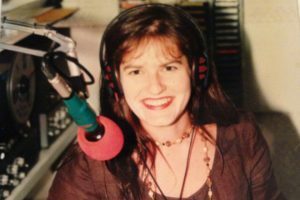 My First Media Gig – Community Radio 2RES in Sydney, age 23. Before we go into a new century you will have graduated as a Naturopath, Nutritionist and Herbalist. It was fun wasn’t it? And that’s because you are now on the right track – you have found your path and you’ve just turned 30. Combining your background in whole food cooking and your love of learning new and old ways to achieve better health and wellbeing is spot on. Don’t doubt it. People will think you have abandoned your love of the healing power of food, as they won’t see the relationship between food and health as you do – yet. Most still see the two as mutually exclusive, so you’ll be even more determined to teach otherwise, by sharing what you know to be true. The mission you went into your natural therapies study with at 27 is still strong – to educate the public on ‘how to use food as medicine’ easily and affordably at home. Strap yourself in dear 30year old Nellie, for you are in for the ride of your life, and it doesn’t slow down in the foreseeable future. Yes, you will run a great health food store, and after that armed with the experience you needed, will open your own cooking school and store, write award –winning, best- selling books and articles, have a long running love affair with the media including an internationally acclaimed TV show, have a busy naturopathic practice, and eventually reach many more people around the world using something called ‘social media’. You’ll love it all and will continue to feel privileged to be doing what you’re doing. Your years cooking, with your Grandma for so long, then in an Italian then vegan restaurant will serve you very well indeed, especially when you’re writing the many loved recipes you will create in the years to come. These will be published in 3 best-selling recipe books over the next 15 years, and one reference book first up. Your desire to open a health food store with an herbal dispensary after graduation will not happen exactly as you want it to, and that will be a blessing, (trust this). You will take over the running of an existing health food store in Sydney, (yes you’ll move back to Sydney from Brisbane as soon as you graduate and will stay there for 10 more years. Sydney will be good to you but you’ll always be yearning for a rural life). You’ll have many staff, and this will be an extraordinary experience over the next few years. Here you will learn an enormous amount about food, health, different diets and your healing nature will start to show itself. Many years later you will sign as the ambassador to Lifestream, a line of sustainable, vegan supplements you stock and sell during this time in the store. This will be a good decision for you, Lifestream and the general public, as people will become increasingly confused about good supplementation. You will be very satisfied in this role in the health food store, yet struggle with your own health during this time, as your life will be unbalanced – too much work, planning and drive, and not enough relaxation, receiving or play. In this position you will give your adrenal glands a battering. Be careful and try to rest, as you will still have the tendency to do too much, and the pace isn’t going to slow down anytime soon. The faster you learn you need (and naturally deserve) to rest, the better off you’ll be. But…the message of good food, wellness, ‘food as medicine’ and the relationship between them won’t become mainstream for at least another 10 more years, so unfortunately you’ll find slowing down impossible until it is. Like I said, strap yourself in. Your Chinese horoscope of the Monkey is very obvious during this time – you are always ‘doing’ and always busy, but you won’t stop, as what you’re doing is a ‘calling’. It’s not negotiable, and you will continue to put your own wellbeing and happiness second. Subsequently you will experience periods of loneliness during your 30’s, as you will be working very hard and definitely on a mission. You will give up a lot to get your message ‘out there’. Keep asking yourself if it is worth it. You will keep answering ‘YES’. Your inner world will become stronger and stronger; your spirituality continues to deepen. In 2004, five years from where you are now, (also the year of the Monkey in Chinese astrology – your sign, and an ‘8’ year for you in numerology – your own life path number) after leaving your job in the health food store, your first book Elixir: How To Use Food As Medicine will almost write itself and be quickly published. It will continue to sell for years to come and be used in natural therapies colleges around the world. It will also be nominated for numerous awards, and you will do a second edition in 2012, just as your second recipe book is coming out. That same year, in 2004, you will have just finished an extensive renovation on old building in Surry Hills in Sydney, in a dingy part of the neighbourhood not yet trendy. You will transform this old 2 story building in Crown Street, Sydney’s soon –to-be- hippest foodie and bar area – into your clinic/ cooking school upstairs, and a health food store with a dispensary downstairs. By this time you will have been working on commercial TV for a couple of years, and if you thought your were busy before – ‘ha’. Be prepared, as the speed of your already overflowing life is about to accelerate. Your 30’s are busy. Please take care! As your dream shop is about to launch on 04.04.2004, literally a few weeks before opening (and the simultaneous launch of your first book) divine intervention will take place, and you will receive a strong message not to run the store yourself as it will prevent you from being available to keep on going with the bigger picture – getting the ‘food as medicine’ word out there nationally and internationally via the media. Plus at this point you will be desperate to leave Sydney and find your own piece of paradise, and nest. So, you give the shop to a friend to run and he will continue to do this for at least 10 years, perhaps longer. You’ll still open your clinic/cooking school upstairs on 04.04.2004 and run seasonal, organic cooking classes that will be very popular, and your naturopathic practice takes off. I know you never saw yourself solely in private practice and no you won’t be, but you will find this part of your life far more rewarding than you thought – your healing abilities will continue to strengthen and develop and you will go onto study Traditional Chinese Medicine and Kinesiology, and love both. Your dream of moving to the Byron Hinterland will finally come to fruition in 2010, and you will find your own piece of paradise. You will be very, very happy here, growing your own food and being amongst a like- minded community of foodies and greenies also on their own mission to be of service to the planet. You will still be very busy, and travelling even more, as your determination to teach good nutrition and to clarify the misconceptions around health and wellbeing will intensify as the general public will by now have accepted that the food we eat can and does affect our health. Because of this many people are now in the media spruiking all sorts of unhealthy products and compromised information. This just makes your resolve to keep going on this path stronger. By 2014 you will have your 4th book published which will be reprinted even before it hits the shelves, and you’ll be producing and presenting your own internet series – shot in your beautiful home, and around the Byron hinterlands – as by this time quality TV is pretty rare. It’ll be all about the Internet in the new century and ‘on-demand’ viewing. This’ll suit you, as you will always be uncomfortable being pushed to use unhealthy, unsustainable products just because a company is sponsoring your show. In fact, this is precisely the reason you end up leaving TV, because you wouldn’t yield to this pressure. Leaving your TV show will break your heart, but it will mend in time. So my dear, you always knew you had to do something big with your life, and you have. It doesn’t stop or even slow down – in fact quite the opposite. You’ll always be very grateful for your life and the amount of love in it, yet many times you will feel that ‘the spirit is indeed willing, but the flesh is weak’, and this is because you have trouble listening to your body when it’s telling you it’s had enough for the day. Actually you hear it but you outright ignore it! Then you’ll learn that no herb or healing food will take the pace of rest. You will need to learn to meditate regularly, and as soon as possible, and keep your running, yoga practice and ocean swimming up. Be kind to yourself Miss. You will eventually learn this with time, around 45years old. Yes it’ll take you that long. Balance is something you’ll always be trying to achieve and sometimes you will. The problem won’t be what you’re doing in your life, it’s what you’re not doing – and just like now, that will be ‘stillness’. If you can learn to tame your inner monkey just a little, you can continue swinging on those branches for many years to come. If you don’t, then you will experience periods of physical, spiritual and emotional imbalance, and fall out of the trees. There’ll come a time in about 15 years when you will receive a second calling. Listen closely for this, as the volume won’t be as loud or as clear as the first. However, this will potentially be just as important for society, and you, as your first mission, for it will be in alignment with the next phase of healing coming through on the planet – and for all who dwell therein. Nellie, I’ll leave you with this – see the beauty in yourself as much as you do in others, and all will be ‘right’ in your world.